Engaging in leisure activities adds flavor to your daily existence. These actions can include your favorite hobbies or simply the way you choose to relax after a long day. They also include activities that directly relate to the other areas of your life. You can be passionate about your relationships, health, finances, or career. As an example, many people view their jobs as something more than just a way to make money. For them, it’s a calling that takes up a lot of their free time as they learn about their industries and network with others who share their interests. In this section, you’ll learn how to build “leisure habits.” These should always be scheduled into your day because they create balance and help you avoid the stress that comes from trying to do too many things. You’ll find that some of these habits are organized a little differently here. 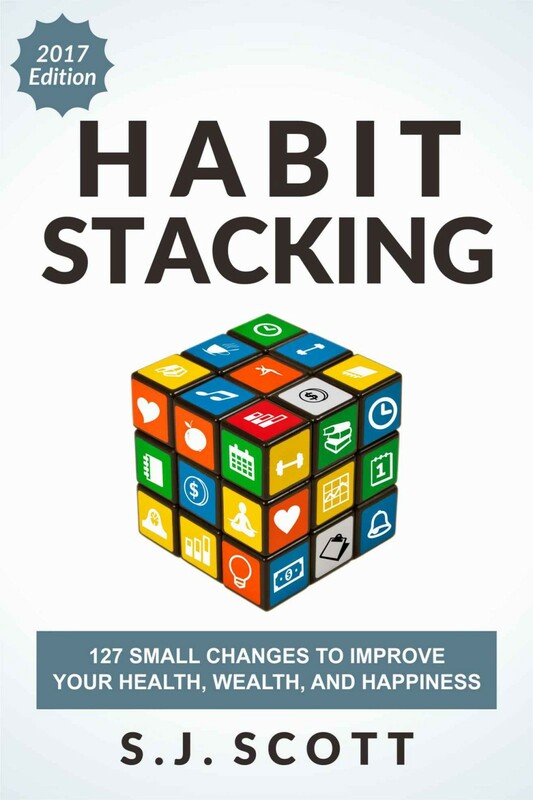 Some of the entries don’t strictly follow the “five-minute rule” that’s recommended for most habits in a stack. But I have included them here because it’s important to reward yourself with fun activities when you’re focusing on self-improvement. Let’s get started with the first example. Benefit: It’s fun to learn new things on a regular basis. You could pick anything from juggling or coding to speaking a new language. Not only do these activities challenge your mind, but they can also become an enjoyable hobby that reduces your stress. That’s why you should consider practicing self-education to learn something new. Description: In my book Novice to Expert, I talk about a lot of ways to efficiently learn new skills. Two of the strategies that I discuss are to schedule time for deliberate practice and to research what you need to learn. Odds are, five minutes isn’t enough time for deliberate practice—but it’s perfectly adequate for researching one skill-related topic or a challenge that you’re currently facing. As an example, one of my current goals is to complete a few triathlon races. The problem? I don’t have a bike. So, today my “practice self-education habit” was researching the specific questions to ask when buying a road bike. With ten minutes of research, I learned about the difference between wheels, pedals, and frame materials on a bike. While this doesn’t give me an expert-level knowledge on bikes, I now know the right questions to ask when I head into the shop later this week. Practicing self-education is a perfect task for those longer breaks during the day, like on a drive, at lunchtime, or in the evening. This is the time when you can listen to podcasts, scan through blogs, or read books that focus on one specific, interest-related challenge. Benefit: Connecting with the celebrities in your interest is a great way to increase your knowledge and enjoyment. This won’t work for all hobbies (like professional sports), but if you’re passionate about a smaller interest (like the game Magic: The Gathering), then it’s not that hard to connect with the rock stars of that world. The trick is to contact them in a way that makes you stand out from the masses. 1. If you are new to a hobby, stick to educating yourself through blogs, books, and forums. These should cover all the “getting started” questions that you might have. This is crucial because the last thing you want to do is waste an expert’s time asking a question that could be solved with a quick Google search. 2. Be polite in your outreach efforts. Don’t expect an answer to everything you ask or get angry when someone doesn’t reply. Again, we all live busy lives. So, it’s not fair to “insist” a person take time out of their day to respond back to you. 3. Begin with a simple interaction. Usually, a few sentences is enough. You can start by saying how they’ve inspired you, then move on to a simple question or two. Keep it short and simple because this increases the likelihood that you’ll get a response. And then, if the person responds back positively, you can continue the correspondence. It’s not hard to connect with celebrities in most of the smaller industries. Usually they are the writers, bloggers, podcasters, and coaches that create great content on a continual basis. If you stick to these three rules, then you’ll discover it’s not hard to find and introduce yourself to these people. In my opinion, reading is a leisure habit that should be enjoyed throughout the day, but it can also provide a mental break between two difficult tasks. Description: Set aside five to ten minutes to read when you feel like relaxing. A chapter is the perfect length because it is long enough to complete one strategy (nonfiction) or one scene (fiction) without it disrupting your workday. • Ask for recommendations from friends, family, coworkers, and mentors. • Google: best [genre] book. • Google: best [genre] book [current year]. • Browse Amazon’s Top 100 List (look in your preferred category). • Join Goodreads and see what others have enjoyed in your preferred genre. If you bring a book wherever you go, then you’ll always have a way to relax for five to ten minutes during a hectic workday. Benefit: We all have a responsibility to stay informed about what’s going on around the world (and not just in your country). You don’t need to be a geopolitical expert, but you should be able to hold a conversation about the major world events and know enough so you can make an informed decision when voting, volunteering, or donating money to charities. Description: Now, I was a little hesitant to include this habit in this book because of the current political climate here in the United States. Specifically, there have been many arguments about the different news outlets and which ones citizens can trust. Instead of getting your news from only the outlet that confirms your world viewpoint, focus on the websites that are either “politically neutral” or that aggregate news from different resources. You don’t have to read every article, but skim the headlines and check out the items that are of interest to you. Remember that even the most well-respected news institutions are often biased in some way. It’s important to form your own opinions instead of simply regurgitating what you’ve read online. Benefits: Expanding your vocabulary comes with a wide range of benefits. You’ll increase communication skills, give your brain a small workout, and improve your confidence in social situations. All of this is possible if you commit to learning one new word every day. 1. Change your Web browser homepage to the “Word of the Day” from Dictionary.com. 2. Subscribe to a daily email, courtesy of A.Word.A.Day. 3. Buy a word-of-the-day desk calendar. 4. Download a word of the day mobile app. 5. Look up word definitions whenever you hear a new one. Lastly, look for a way to introduce this word into a conversation with friends, family, or coworkers. Sure, you might get the occasional odd look, but the fastest way to learn something new is to use it regularly. Benefits: Adult coloring books are in vogue now. Studies have shown that adults who spend just a few minutes coloring are more focused, relaxed, organized, and calm. The act of coloring can be therapeutic to anyone who regularly experiences stress in their lives. Coloring books may be a bit of a fad, but they are backed by solid science showing the efficacy of the distraction of coloring on mental health, even for adults. Many psychologists prescribe coloring as an alternative to meditation, because it can have a relaxing and calming effect. Even Carl Jung was a fan of coloring. • Reminding you of simpler times and temporarily returning you to younger, happier times. • Increasing your focus and concentration. If you’re having trouble with a difficult task, you can take a coloring break until you’re ready to try again. • Creating a relaxing flow state that’s like other mindfulness and meditation habits. Coloring books may not be for everyone, but if you often feel worn out and stressed at the end of the day, then taking time to do a little coloring can become a relaxing, meditative habit. 1. Go to Amazon to browse adult coloring books. 2. Buy a few that look fun or match your personality. 3. Purchase markers, crayons, or colored pencils. 4. Take frequent breaks when stressed for five to ten minutes of coloring. You might not want to carry a coloring book everywhere, like you would with a book, but if you keep one on hand at home, it can be a fun way to reward yourself between tasks or whenever you feel the need to unwind. Benefit: Most children love to draw, but as adults we get too caught up in trying to make our drawings “good.” We end up branding ourselves as “not creative” and never pick up a pencil again. As a result, we lose our passion for art because of a perceived lack of talent. But doodles and sketches are not fine art. How good you are (or aren’t) does not matter. Creating a quick five-minute doodle or sketch is like playtime for the brain. It’s therapeutic. It helps reduce stress. It inspires creativity. It can even boost your productivity by reengaging your creative mind at a time of the day when people mostly think about what they are going to do when they get home. Description: Get yourself a sketchbook and a selection of pens and pencils. In the late afternoon, when your creativity is slipping, set aside five minutes to draw whatever shapes and designs you desire. You could attempt a quick still-life sketch of objects in your kitchen, your cat, or a simple abstract doodle. The object isn’t to improve your artistic skills, so don’t worry about the quality of your drawing. Just use this time to free your mind and relax. Benefit: Doing puzzles gives your body and mind a variety of benefits. A study done by the University of Berkeley used the brain scans of test subjects to show how puzzles can positively affect the brain and ward off diseases such as Alzheimer’s. Puzzles can also help relieve stress by engaging the mind on something specific, allowing you to have an escape from your everyday life. As an example, last year, my wife and I were limited in our choice of activities due to her pregnancy and the cold, brutal winter in New Jersey. We couldn’t do the outdoor activities we usually did (e.g., skiing, snowshoeing, and hiking). So, to prevent us from “vegging out” on the couch in front a TV, we spent our nights working on a monstrous 5,000-piece puzzle. Not only was this a relaxing way to spend time, but it also reduced some of the anxiety we both were experiencing as soon-to-be parents. 1. Solve crossword puzzles as a team: Research has shown that working as a team can improve your speed of talking and thinking, as well as your ability to collaborate. It has also been found that puzzles can strengthen social bonds through the creation of a shared memory and group accomplishment. So, find a group of friends, family members, or coworkers, then print off a big crossword puzzle and make it into a game. The social interaction will likely help you to burn off some steam. 2. Grab a puzzle whenever you feel depressed: For many people, unhappiness lies in the stressful nature of our everyday lives. Doing a quick puzzle helps to relieve this stress by deeply engaging the mind. If you feel a small bout of depression coming on throughout the day, grab a puzzle. This will help you escape in a lighthearted way. In short, puzzles can both reduce stress and give you something to share with the important people in your life. So, if you ever need a break that doesn’t involve passively sitting in front of a television, then I highly recommend building this habit. Benefit: There is something about being stuck in a single building all day that just drains the soul. Perhaps it’s the unnatural lighting or the line of cubicles. People aren’t meant to be cooped inside all day long. But if you take a few minutes to get outdoors throughout the day, you’ll get a regular dose of vitamin D that comes from exposure to the UV rays, which our bodies need to function. Spending even a few minutes outside whenever you get the chance can do wonders for your physical and mental health. There is increasing evidence that shows spending more time outdoors can reduce stress, combat depression, improve sleep, and have a positive effect on your well-being. In fact, a study published in Environmental Science & Technology found that just five minutes of exercise in a “green” environment led to mental and physical health improvements in the study’s participants. Description: Every job, no matter how grueling, has breaks throughout the day. Rather than spending this time making coffee or browsing the Internet, go outside for five minutes. You can do the mindful walking that we’ll discuss in habit #118, or you could look around and take deep breaths of fresh air. Even if you live in the city, with little easy access to greenery, getting a few minutes of exposure to natural light will increase your vitamin D levels and improve your overall health. Benefits: Motivation is fleeting. You might feel excited one moment but then experience a crash in emotion when something negative happens. One habit that can be used to “reset” your motivation is to watch an inspiring video. Description: You have a few options with watching inspirational videos. TED Talks are inspiring lectures from the most visionary leaders of our time. They tend to be ten to twenty minutes in length, so you might need to commit to a longer habit, or watch a single video over a few days. You can access these videos directly through the TED website, but they are also accessible on a mobile app (iTunes & Android) and through a video streaming service like Roku. If TED Talks aren’t your thing, then you can also find inspirational videos on Upworthy or your favorite YouTube channel. Watching a good video will not only give you a boost of happiness to start your day, but it can also positively impact the way you look at the world because you’re constantly introducing new ideas into your subconscious. Finally, I recommend limiting your viewing time. It’s far too easy to turn a five-minute break into several hours of passively watching videos. My suggestion: stick to one video per break. Benefit: We all have one life to live. If you’re not proactively experiencing all that this world has to offer, then you are missing out. Sure, I get that you have a job, family, and infinite number of other obligations—but you should also try to expand on your long-term plans. The simplest way to do this is to create a “bucket list” of all that you’d like to accomplish in your life. My suggestion is to create a list of your own and then regularly add to it on a weekly or even daily basis. More importantly, make a plan for how you’ll check off items from this list. Description: To get started, I recommend creating a list using an idea-capture device that you always have nearby. It could be a journal, a computer document, or an app like Evernote. It doesn’t matter where this list goes—just make sure it’s an item that’s always on you. Imagine the different things you would like to be before you die. This can include building specific skills or roles you’d like to achieve. Simply think of the perfect version of yourself and what type of person you aspire to become. For some people, material possessions are important, while others don’t care about the amount of “stuff” in their lives. If you’re someone who is interested in enjoying the finer things in life, then you can jot down the items you want to own before you die. Here, you’ll determine what you want to accomplish in life. These can be small goals or a major life-defining moment. It’s important to visit places you’ve never been before. I believe you can learn a lot about yourself by traveling to a new location and having new experiences that outside your comfort zone. In this section, you’ll jot down a list of the places you would like to visit. This last question is a “catch-all” for the previous four sections of your bucket list. Here you’ll write down the memories that will last a lifetime. This could be a specific event you’d like to experience or a simple moment that adds significance to your existence. Finally, I recommend adding to this list as a regular daily or weekly habit. Whenever you think of something you’d like to do, or hear of an interesting experience, take a few seconds to pop it into this list. Do this often enough and you’ll come up with an extensive collection of ideas you can share with others or do on your own. Benefit: In the previous habit, I talked about the concept of the bucket list. While this a habit that I personally do, I find that most people can’t do much with this list because they lack the time. So, a different habit that I’d recommend is to write down the things you’d like to enjoy soon—like in the next three months. The idea here is simple: since three months is the immediate future, you have a better understanding of what you can and can’t do. And, more importantly, you can make plans to act on these ideas. Description: Make a list of twenty fun and enjoyable things you want in the next three months. This is not a goals list. Instead, it’s a list of fun or even odd things you can enjoy by yourself or with others. The only requirement is that each item needs to be something that makes you happy. Next, you have to make time to do these things. You’ll sleep in late one day. You’ll go buy that new grill. And you’ll schedule time to play baseball with your son. It’s too easy to fall into the trap of spending your days working, running errands, and doing household chores. But if you keep an ongoing list of fun activities, then you’ll proactively create opportunities to enjoy life a little more. Benefit: Familiarity breeds contempt. We might like our routines for the comfort and predictability they give us, but over time they can become draining. If we aren’t trying anything new, then what’s the point of being alive? By trying something new every day, you increase your overall satisfaction and make yourself a more well-rounded person. Description: While maintaining some stability in our lives is important—such as paying bills and getting to work on time—making changes in routine and trying new things make our days exciting by giving us things to look forward to. 1. Change up your daily routine order. If you usually shower, get dressed, and then make coffee and have breakfast in that order every morning, try switching things around. You could make coffee and breakfast before showering and dressing instead. 2. Try new food. You may have become so accustomed to your favorite foods that they no longer taste all that good. When grocery shopping or going out to eat, look for items you’ve never eaten before and try them. 3. Talk to someone new. You can really gain a new perspective on life through talking to people you haven’t met before. This could be someone who you work with but never interact act with, or somebody in line with you at a coffee shop. 4. Take a different route to work or home. You’re probably so used to driving a particular way that you could practically do it in your sleep. On occasion, deviate from your usual route. This change of pace will make you feel much less like a zombie when commuting. 5. Reduce Internet usage. You might be used to reaching for your smartphone whenever the mood strikes, but this just lends to your complacency. Get out of your Internet comfort zone and reach for a book instead. Changing up your routine doesn’t require a large daily time commitment. Really, all you do is switch up one routine or action. Sure, you won’t enjoy every experience, but this habit will also keep your mind from going stale from doing the same thing over and over. Benefit: Throughout this book, I’ve emphasized the importance of avoiding distractions to focus on what’s truly important in your life. But if your daily existence becomes a constant list of goals, habits, projects, and chores, then you’ll quickly burn out. That’s why it’s important to enjoy the occasional distraction between blocks of effort, at the end of the day, or even during a “mini-vacation” where you spend time doing an activity that you love. There are countless ways to reward yourself—and, sure, some of them will take longer than five minutes. That’s why you should only do them after you’ve completed the critical daily tasks. But it’s important to proactively plan fun activities just as you would with any other habit. That way, you’re not just singularly focused on working, exercising, or getting things done. © 2019 vik.im. All Rights Reserved.